When you enter your workspace, the first tab you will see every time is the Dashboard tab. This tab is less functional than it is informational; it provides statistics and details regarding entries and reviewers in your workspace. On the left hand side of the dashboard you will be able to see the date of last activity in the workspace, the number of entries to date, and the number of people who are in your workspace. Further down, you will see a Quick Links > Settings button; here you can modify your logo, adjust the color scheme, and make other custom changes to the workspace. The dropdown at the top of the page allows you to select from a variety of reports. By hovering over any of the dashboard reports you will be able to see the numerical value or percentage associated with the data point you are hovering over. 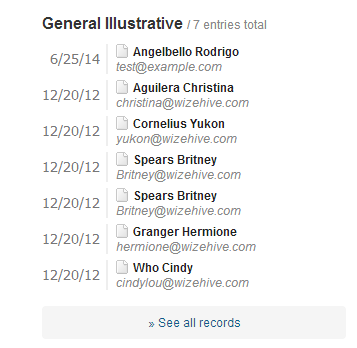 This report provides a visual way to see how many entries are held in each folder. In the upper right corner, you can select to view the graph as a bar or pie chart. Clicking on either a bar or slice of a chart, will make the entries contained in that folder appear on the right. Clicking on any of these entries will display a pop-up of their form. This report shows how many entries have been submitted per day for the past 2 weeks. In the upper right corner you can select to view it as a bar or line chart. Clicking on a bar of the chart will display the entries that were entered that day on the right hand side of the page. This is similar to the previous report, but instead of showing only the past 2 weeks, it shows how many entries have been received each date over the lifetime of the form. This can only be displayed as a line graph. 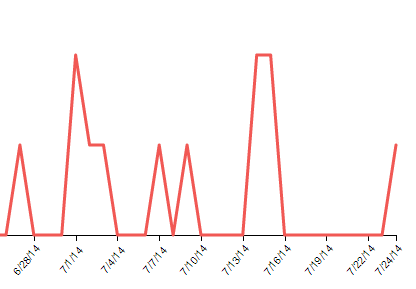 This report displays the number of reviews that have been completed on each day the form has been live. Remember voting is just a simple review form, this will display the number of votes per day if there is voting. This can also only be displayed as a line chart. Displays the number of reviews that are yet to be complete. This is only available as a line chart. Shows the number of people that have visited the review or voting portal each day. This is only available as a line chart. Displays how many entries were contained in each folder on each day over the past 2 weeks. This chart can be viewed as a line chart or bar chart. Displays the total size of the uploaded files in each of the folders. Only folders that contain uploaded files will appear in this report. This report is only available as a bar chart. This report enables you to view how long people are taking to complete their applications. This tracks the amount of time from when users create a username and password to create the form to when they submit. This is only useful for Advanced Cart and Application Forms. This report is only available as a bar chart. 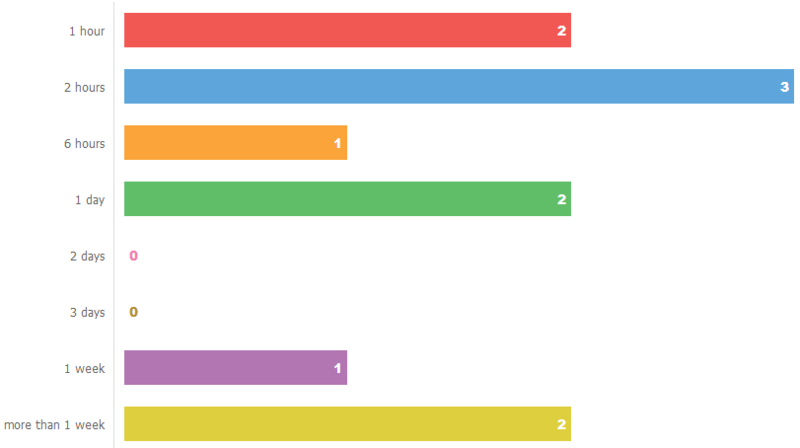 This shows how many recommendations have been received and requested on each day. This chart is only available as a line chart. You can share all dashboard reports by clicking the Share button in the upper left corner. 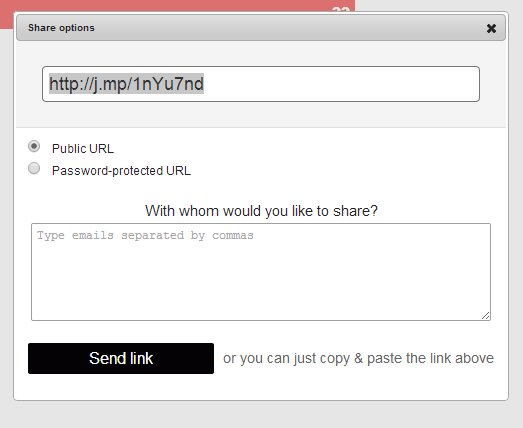 Sharing a report creates either a public URL or a password-protected URL. By selecting password-protected URL you will be prompted to create a password to access the webpage. You can then list the email address of the people with whom you would like to share the report or you can copy and paste the URL and share it yourself. You also have the ability to export the report by selecting the Export button in the top left corner. When clicking this button you will be asked if you would like to download a .csv file of the report or print a .PDF.